As the name suggests, these tools query multiple search engines and databases. Although many believe Google or Yahoo! indexes every web page, that’s not the case. There are many reasons why one search engine may index one page and not another. The flip side is results often overlap between the search engines. Meta-search engines can address these problems. The goal of the metasearch engine is to run your query against a defined set of search engines and extract, filter, and rank the results. One advantage of meta-search engines is they combine the results. Most of these tools provide the source of the listing since they don’t own the databases. 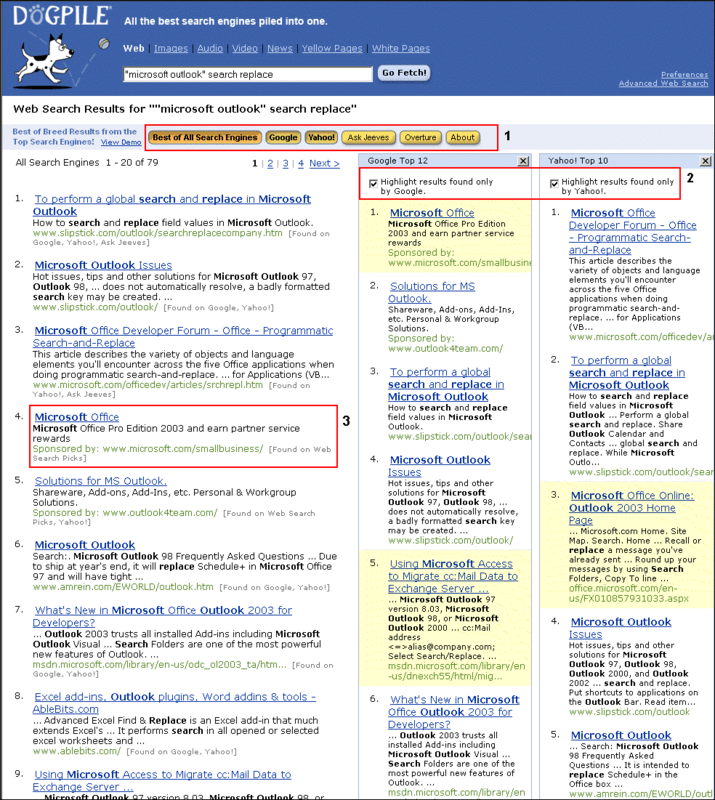 In the example below, the article was indexed by both Google and Yahoo!, but displays once. As with traditional search engines, there is competition with the meta-search engines as each tries to offer an advantage. Some services search more databases or allow you to see the overlap. Other examples include clustering or grouping similar concepts. Clustering is a feature that can refine your search results when you have a query with many or unknown meanings. For example, the term “mambo” is both a dance and an open source program and would produce different clusters. Although meta-search engines are useful, there are disadvantages. 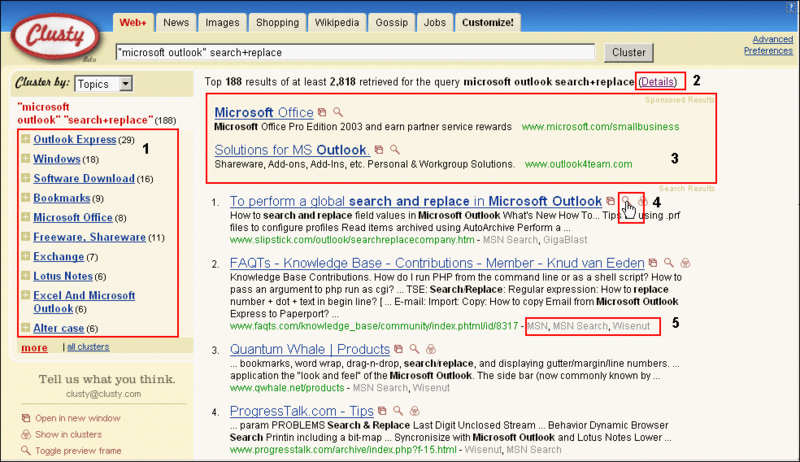 Most search engines allow you to refine your search by using advanced search syntax or qualifiers. For example, Google allows you to restrict your search terms to a specific section and domain. However, it’s difficult for a meta-search engine to offer that precision since the search syntax is usually unique to the source database. The advanced search strings you use in Google may not work with Yahoo!. 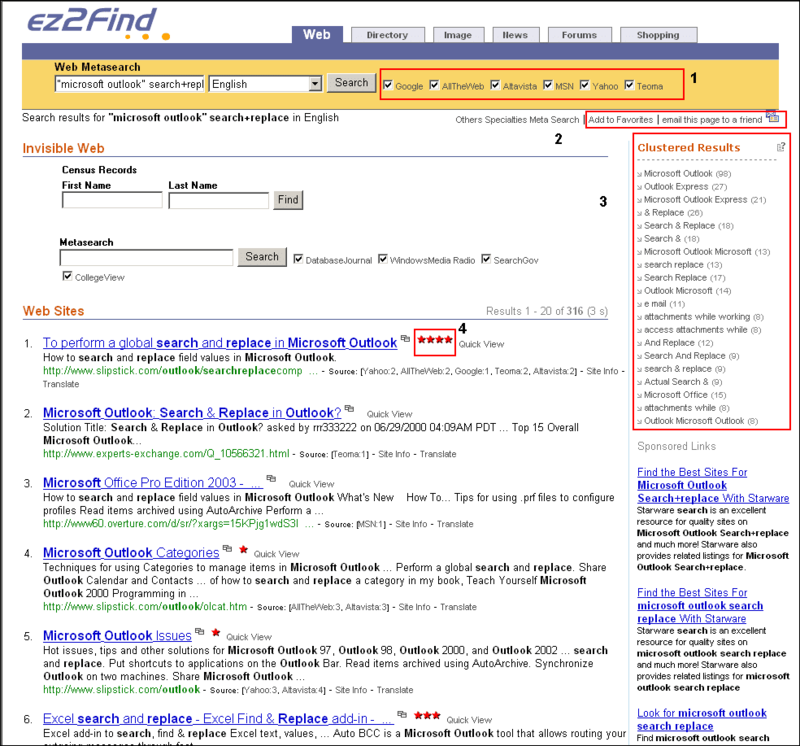 As a result, most meta-search engines use simple searching. There are many meta-search engines. We’ve provided a sampling of ones we’ve used with annotated screen snaps. Like most tools, they don’t work in all situations, just as a hammer doesn’t work as well with screws. We suggest you experiment with these services the next time you search. Clusty is Vivisimo’s meta-search engine that offers enhanced features such as clustering. Aside from the usual search tabs, Clusty includes Gossip and Jobs. It also allowed us to narrow our search using quotes and the + sign. Your results show clusters on the left. You can easily see how many items are in each cluster. Clicking a cluster filters the search results on the right side. At the top of the page is a (Details) link that shows which search engines were used and how many results came from each engine. Sponsored results are separated from search results. You may also use the Advanced features and remove sponsored listings. You can see a preview of the page by clicking the magnifying glass to the right of the title. The source of each entry is listed after the URL. Update: Company was acquired by Yippy in 2010.
Who says you can’t teach an old dog new tricks? Although Dogpile has been around for a while, they recently added some nice features that set the service apart. If you ever need to prove to someone that Google doesn’t include everything, this site should be your starting point. At the top of the page, you have a button for each search engine. If you click a button, a column appears to the right with the results for that engine. 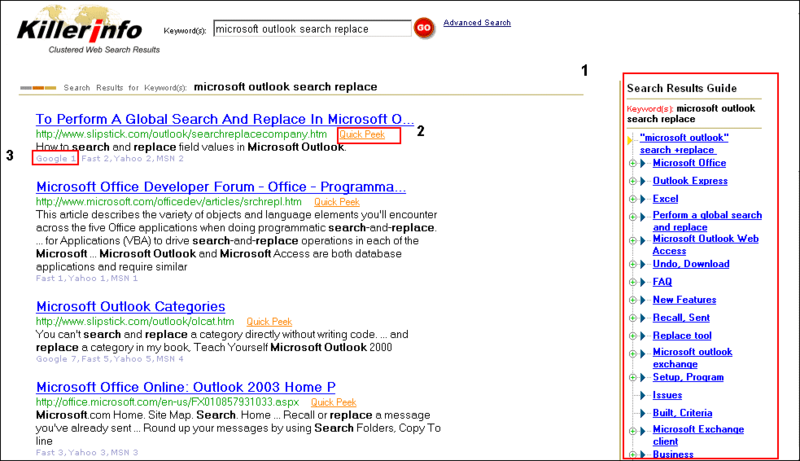 This makes it easy to do comparisons between search engines. You can also highlight entries that are unique to a search database. These entries show in yellow. In the example above, Google had 2 pages that Yahoo! didn’t include and Yahoo! had an item that Google didn’t have. One item we disliked was how sponsored items appeared in the listings. Update: The site exists but has been sold several times. ez2Find offers a lot in their service. Like Clusty, it provides clustering although the groupings are much different. In our testing, we found the clusters to be more representative of what we were searching. This may be a result of their logic and the databases they search. This service includes Google and Yahoo! but adds a 1000 more databases that are not selectable from the top bar, but appear in the Invisible Web section. Although ez2Find has a separate area for sponsored links, it included an ad at the bottom. Typically, this doesn’t bother us except it was one of those obnoxious flashing types that made the site seem less professional. At the top, you can select which of the main databases to search. Links are provided for sending the results URL to a friend in an email. Clusters are shown on the right side. You can click a cluster and the results will filter accordingly. Red stars mean the result is listed in multiple search engines. The entry above appears in 4 different search engines. If you click the Site Info link for a result, you can see their Alexa page. Sources: Google, AlltheWeb, Altavista, MSN, Yahoo! and Teoma. Killer Info is another clustering example with a clean interface. It doesn’t have as many options as the other sites, but there was something refreshing about not seeing ads. You can click the Quick Peak link to see a part of the web page. You can click an engine link under a result to move to that search engine. Sources: AOL, Google, Yahoo!, MSN, FAST, Lycos, AltaVista, Netscape, Wisenut, Overture, LookSmart, and DMOZ. Author’s note: The text of this original article got munged. However, through the work of the Wayback Machine, I was able to recreate it and add my images.